This is part one in a series designed to launch your DIY SEO campaign. If you're opting not to hire an agency and dive into SEO yourself, it comes down to knowledge and having the right tools. True DIY SEO involves being able to create focus plans for keywords and track your progress, making organized and clear decisions about your content. The first thing you need to do is keyword research. Much of your other efforts will stem from this, and creating content without this research as a guide isn't as efficient since you'll have to go back and edit. 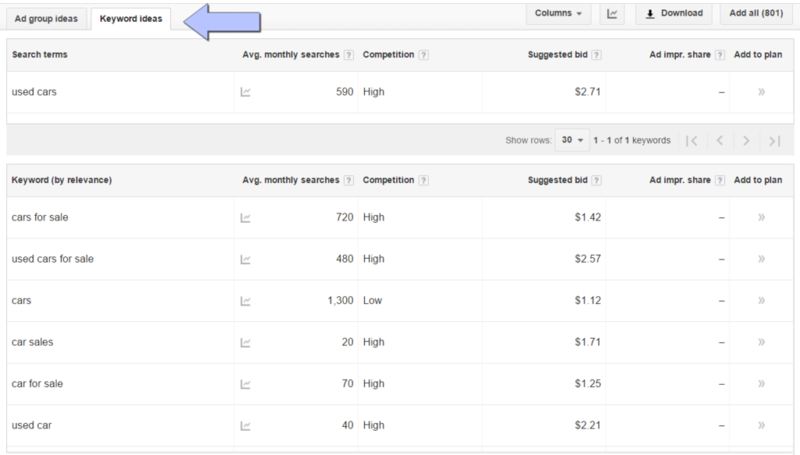 When in doubt, the most basic tool to use for keyword research is Adwords' Keyword Planner. You'll need a Google account to log into google.com/adwords. Whether you're looking to create paid ads or not, you can use the Keyword Planner for free once inside. 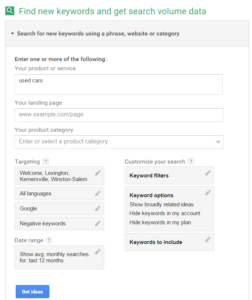 Just sign into Adwords and find "Tools" in the top menu, then select "Keyword Planner". From there you'll be taken to a page with three main options: search for new keyword ideas, get search volume data, or multiply keyword lists. For the interests of this guide we'll be sticking primarily with the first option. You'll see a page that looks like the image on the right. In the first category, clicking it will expand out its options. Begin by entering some topic ideas, separated by commas where it says "used cars" in the image. You can leave "landing page" blank if you want suggestions based only on other areas. But if you'd like Google to look at your site and make tailored suggestions based on what it sees, enter a URL there. Select a topic category to better help Google understand what you're researching. This is useful but also optional for your DIY SEO efforts. Next under "Targeting" you'll see that you can enter geographic filters. List as many cities, zip codes, or regions as you like, or leave that blank to get global traffic data. Negative keywords is an option to filter out negative variations of keyword ideas. If you're looking up used cars, for example, it may exclude search phrases like "the worst used cars of 2016". Sometimes you may actually want to include these; it's up to you. The rest of the filters you can usually leave at default, including searches for the last 12 months for a nice average. When you're ready, click the "Get ideas" button. Click on the "Keyword Ideas" tab and you'll get a list similar to the image below. It will begin with keyword data for the exact phrase(s) you entered — in this case "used cars". Underneath you'll see a list of related phrases, along with the average monthly searches and how competitive those keyword phrases are. Competition is a measure of the ratio of how many people are searching for that keyword versus how many relevant results there are. It's an indicator (to some degree) of how challenging it will be to rank for that keyword, but don't let high competition words scare you. They are often the stronger keywords, and phrases with lower competition like "cars" in the example above are too generic. Generic search traffic often means you'll get a lot of site visits, but low engagement because your site might not have been what they meant. Even without digging too much deeper, this quick list will give you an idea of wording to use. For example, what if "mortgage details" gets twice the search volume "mortgage information" does? Good to know that before writing your article even if the subject matter is largely the same in either case. Once you have a base keyword list to start from, you're ready for the next step of your DIY SEO campaign. Google Analytics monitors traffic on your website. In its most basic sense Analytics will tell you how many visits you're getting, where those visitors are coming from, and how long they stay on the site. But you can also use it to track specific conversion goals (i.e. if users do certain things while on the site). 2. Google Webmaster Tools. While you're connecting your site to some of these tools, it's a good idea to set up Google Webmaster Tools as well. You can connect Webmaster Tools to your Analytics account so they can share data, allowing Webmaster Tools to give you more advanced insights. Webmaster Tools allows you to submit sitemaps, which show search engines the structure and hierarchy of your pages. Doing this can also improve how many of your site pages are indexed by Google and Bing. Beyond submitting URLs, Webmaster Tools will also tell you the major keywords visitors have found you by and what your average rankings for those keywords were. You'll need to verify your site when you add it to Webmaster Tools. Generally you can do this a few ways. If you've already inserted your Google Analytics tracking code you can verify the site with that (as long as they are both through the same Google account). Otherwise you can upload a small file Webmaster Tools provides to the root directory of your site, or even use your domain registrar login. There's also a short code you can insert into the <head> of your site like Analytics. Generally we use the latter option or the Analytics verification for simplicity. 3. Bright Local. Tools like this are essential for tracking your keyword campaigns. Bright Local has a whole bunch of tools, including citation submissions, but the bread and butter of the software is the ability to specify a central geographic area (if desired) and input a keyword list. Each month Bright Local runs a report to let you know where your site stands for these keywords, and also specifies visually where certain words were comparatively on the former reports, and gives a total gain/loss at the top to see at a glance how your site is performing. After you do your keyword research, these reports are a fast and reliable way to gauge the success of your efforts. Bright Local offers a free 30 day trial, and flexible plan levels thereafter to suit however many sites and keywords you want to track. 4. SERPs. A long-time leader in SEO tracking, SERPs provides advanced analytics that combines ranking details with site traffic information. You can gain similar insight about where your site ranks for keywords like you do with Bright Local, but also see details on what content is being shared, how many other sites are linking to you, etc. SERPs even has an API you can use if you want to pull their data into your own reporting systems. It's geared more toward an agency and the pricing is higher than Bright Local, but it's certainly powerful and worthwhile. Since it tracks so many things, it's totally viable to use as your primary tracking tool if you don't use anything else. Stay tuned for the next post in our DIY SEO series: On-Page SEO Tactics.